According to Forrester, "The subscription billing market is growing because more eBusiness professionals across industry verticals see the value in using more complex billing services. Key drivers behind the experimentation and subsequent adoption of transformative business model relationships include a desire for stickier customer relationships, a thirst for customer insights, an eagerness to capitalize on the cloud, and an inclination to experiment with connected products." 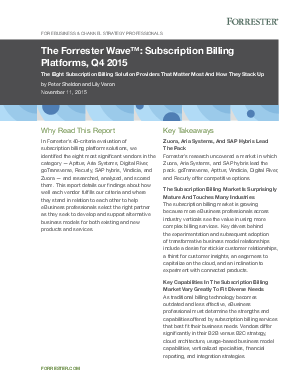 In The Forrester Wave™: Subscription Billing Platforms, Q4 2015, Forrester evaluates the 8 Subscription Billing Solution Providers that matter most and details how each vendor fulfills the 40 evaluation criteria points. Examples of products and services that have been repackaged, re-engineered or developed exclusively for monetization. Capabilities that define the Subscription Billing category. Download your copy of the Forrester Wave™ report and evaluate which subscription billing solution is right for your organization.